6-String Uke but ... What did I buy?? I bought a used 6 string uke that came tuned as ADGCEA. Nothing I've seen so far addresses this tuning. Also the fret board does not look the same as the pictured fret board in the forum, with the C's and A's so close together. It looks more like a small guitar in its stringing. I bought it so I could have a uke in the 2 places I frequent without being concerned with damaging it during travel. I am a brand new student and would like to be able to apply what I learn from your course to both of the ukes. Would you suggest removing 2 strings or something else? Thank you so much for being a part of the Underground! From the sound of it, it seems like you bought a guitar-ukulele hybrid (often called a "guitalele"), which is different from a 6-string ukulele where two of the courses are doubled up (see image above). The usual tuning for guitaleles is just as you got it (ADGCEA) and it is played using guitar chord shapes. Standard ukuleles are basically guitars that are tuned 2 1/2 steps up with the two bass strings removed, so a guitalele is the same thing (except it still has the two bass strings). So you can technically use any guitar tab and play it on your guitalele - the song will sound the same, just in a higher key. 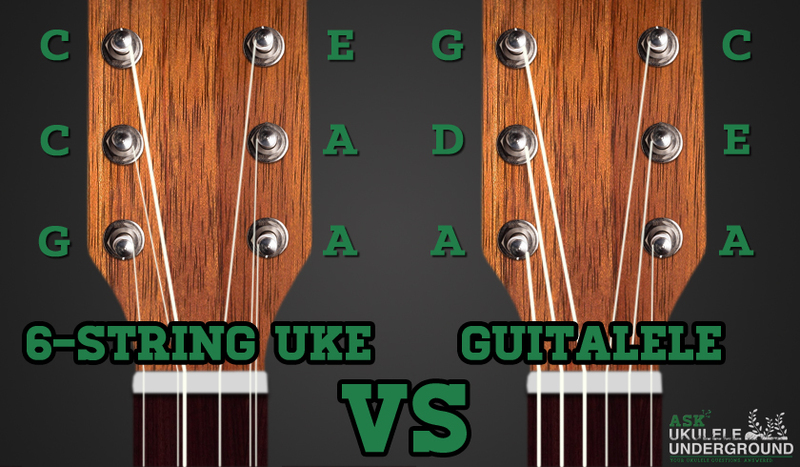 You can remove the two bass strings on your guitalele and you will essentially have a (low G) ukulele, though you would have the extra-wide fretboard to deal with, which can be a little cumbersome. So it's totally up to you, guitaleles are a great way for ukulele players to start learning the guitar or for guitar players to transition to ukulele, so it's worth having around if that's something you're interested in. Otherwise, it might be easier to just pick up another standard ukulele for your second location. NOTE: 6-String Ukuleles can be played exactly the same way you play standard tuned ukuleles. Because the two C strings and two A strings are so close together, you can effectively hold down both strings with a single finger. So all of the fingerings that you use for your chords on a standard ukulele can be used directly on any 6-string ukulele (or 8-string ukulele, where there are doubles of all of the strings). This is not the case with the guitalele, however - if you want to take full advantage of all 6 strings on a guitalele, you need to use guitar chord shapes instead of ukulele chord shapes. Got a questions for us? 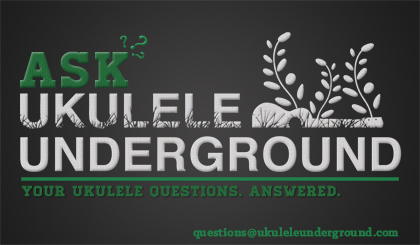 Having problems with your ukulele or ukulele playing? Let us know! Aloha! I just picked up a six string baritone ukulele .tried to tune it and busted a string Im such a rookie. So I play with five strings until I can get a new string. But the lesson was very helpful . I love the music and Aaron playing and the play along is great . I’ll get back to the fun have a lovely day Lopaka ? Hi, I am really interested in purchasing a 6-string ukulele, my doubts are about fingerstyle techniques such as bending, slide, vibrato etc … are these possible on double strings??? I bought a Koaloha 6 string ukulele last year. It has a beautiful tone however I am finding it difficult to play without getting a buzzing from the two extra C and A strings because I can’t put enough pressure on the 2xC and 2xA together. I also want to do more fingerpicking and find it difficult because I cannot press hard enough on the 2 extra strings together. If I remove the additional strings it means the 4 remaining strings won’t be evenly spaced (the 2 middle strings (the C and E) will be closer together). Will this make a difference to the sound? The neck is also wider than a normal tenor. I thought I would remove the 2 extra strings just to try the sound and if I didn’t like it I could put the strings back on again. Unfortunately when the string is ‘unwound’ to the limit the string is still very tight so I will have to cut them off. Can I have your advice please. You best bet would be to wait till you want to restring your entire ukulele. When you change all of your strings, you can leave off a C string and an A string, then if you decide you prefer the sound of all six strings you can just add on the other two. Even if you could salvage the two strings without cutting them, when you put them back on the ukulele, you run the risk of the string snapping. If you choose to go the route of only using 4 strings all the time, you might want to take your ukulele into a shop and have the neck adjusted since it’s built to withstand the tension of 6 strings. Hope some of this info was useful. Possibly putting ukulele strings on a guitalele or vice versa isn’t something we would advise. Guitaleles and 6 string tenors are made for different gauges of strings. If you put the wrong gauge on, it could cause damage to your instrument. You might be able to tell what you have by looking at the grooves on the nut of the instrument. It’s usually the plastic part located at the top of the neck. It holds all the strings in place, and should have grooves where the strings lay on. If the grooves are evenly spaced, you probably have a guitalele. If some grooves are closer to others, you probably have a 6 string tenor ukulele. If you want, you can always send us a picture of your instrument and we can take a look and try to tell you what it could be. I hope this helps with your tenor/guitalele mystery! I have built several guitars, 5 classical and 3 steel string. I am currently building a tenor ukulele. I have recently started playing the ukulele. I love to play finger style solos on it but at times I really miss the two extra base strings that would be on a guitalele. I am considering building one. Could anyone tell me where I could get a set of proper gauged strings for a guitalele. I like to purchase a set of 6-string for my ukulele maybe on-line. Where can I order such strings? I am a wee bit late but I found the explanation very clear and concise. Mahalo for this. I wondered about 6-string uke. the comment understandable for learning and photo most helpful for visual people like me.